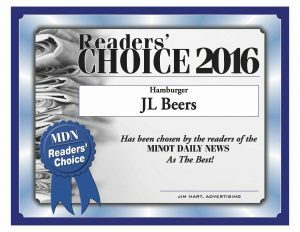 Thank you for voting and awarding us with the Best Craft Beers and Best Hamburger awards once again this year in the Minot Daily News 2017 Readers’ Choice Awards! 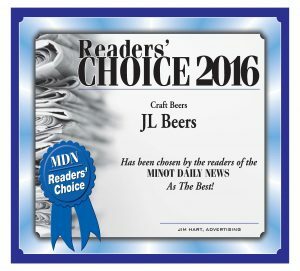 Thank you for voting for JL Beers in the Minot Daily News 2016 Readers’ Choice Awards. We’re honored to have won the Best Craft Beers and Best Hamburger awards! JL Beers is Coming to Minot! JL Beers will soon be a part of the Minot community. The Friends and Family Opening is scheduled for Tuesday, March 3, followed by the public opening on Wednesday, March 4. JL Beers® features a variety of unique burgers, fries and chips, along with 40 different craft beers on tap and a wide selection of bottled and canned beers, many of which are new to the Minot area. After your meal, you can satisfy your sweet tooth with a creamy root beer float; the perfect combination of 1919 Root Beer and Blue Bunny vanilla ice cream. JL Beers® offers burgers with everything from the classic toppings, to the Mt, Mushmore® Burger, topped with sautéed mushrooms and teriyaki sauce, to what may soon become a customer favorite in Minot, the Humpty Dumpty® Burger, complete with a fried egg and cheese on top. All burgers are made with fresh ground beef and served on JL Beers’® own signature bun. Offering high quality food at a reasonable price, the restaurant provides an open kitchen environment that features specialty cooking equipment. Guests can watch as their fries and chips are cut right in front of them, a testament to the fact that all of the food at JL Beers® is fresh and “comes from someone’s backyard”, a phrase proudly written on the JL Beers® website. Jesse Zwak and Wayne Zwak of Minot are the owners of the JL Beers® franchised restaurant in Minot. The manager of JL Beers® is Amy Dauphinais and the assistant manager is John Miller. JL Beers® has been under construction for about three and a half months and should be completed in early February. With décor and staff training to follow, Zwak says they expect to open the restaurant at their set opening date. JL Beers® is currently in the process of hiring employees to join their team, projecting a total of 40 employees to be hired. If a fun and unique dining experience, craft beer, and fresh food are your thing, then JL Beers® will soon be your go-to place. As their motto says, “Seating for 1,000…47 at a time®”! Fargo based JL Beers is coming to Minot. The news was announced today that Minot based ZZ Food Group operated by Wayne and Jesse Zwak would be bringing the franchise to the Magic City. Jesse tells me that they hope to be open early in 2014…and that a location isn’t set in stone yet — but they are strongly considering downtown Minot. JL Beers is known for their craft beer selection and burgers, fresh fries, and chips.